I’m SO pumped for tonight! 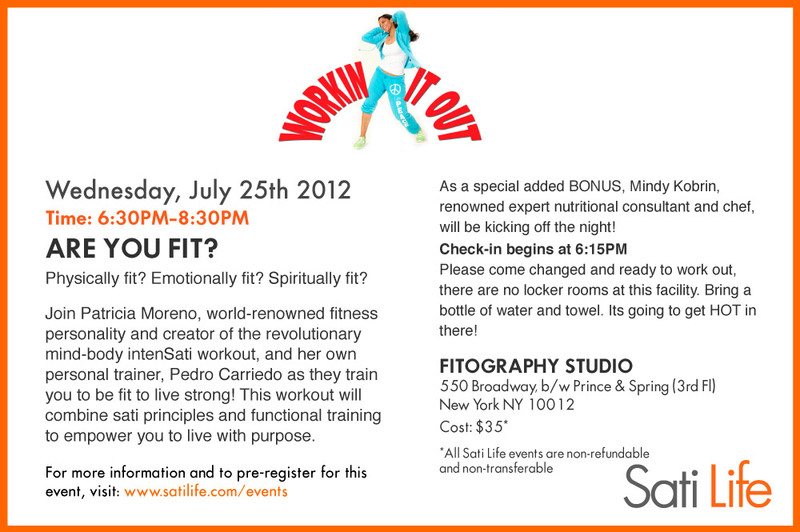 I’m going to be with my friend and fitness/life mentor, Patricia Moreno, for her Workin’ It Out event. Patricia is the creator of intenSati an will be doing her aforementioned workout AND be leading an hour long functional training workout with her personal trainer, Pedro Carriedo. Now, my ego’s not that big that I don’t think I have things to learn. I love going to other fitness professionals to see how they teach and work. I’m SUPER excited for tonight and for all the sorness that’s sure to come tomorrow. If you’re in NYC come come come! Below are the details! Join Patricia Moreno and two special guests as they challenge us to be Fit for Living! Pedro Carriedo, Patricia’s own private personal trainer, will be co-leading the “Fit for Living” workout with Patricia. Pedro and Patricia will challenge you with intense functional strength movements to work your body and your will. This challenge will push you to your limits both physically and mentally and give you more tools to enhance your workout regime. In addition, Mindy Kobrin, expert nutritional consultant and chef, will be kicking off the night with a 10 minute demonstration of how to prepare simple recipes for healthy, delicious food in a hurry! This amazing Workin’ It Out event is designed to ignite your true strength and inspire you to live strong from the inside out! *The event space is NOT a gym. Please come dressed and ready to work out. Remember to bring water and a towel with you. All WIO Events are non-refundable and non-transferable. This entry was posted in FIERCE FUN, FIERCE HEALTH, FIERCE SOUL, FIERCE WORKOUTS, FIERCE- ISH and tagged #self, fitness, health, intensati, nutrition by GETFIERCE TRAINING. Bookmark the permalink.